Moordvrouw star Renée Soutendijk is back on the big screen in this lavish, controversial remake of Dario Argento’s classic 70s horror. The past few years may have seen Soutendijk become a fixture on RTL 4, but recently both the Amsterdam-born actress and her Moordvrouw co-star Thijs Römer have enjoyed parts in theatrical films. Soutendijk, of course, is well acquainted with the silver screen, with her many film credits including some of Paul Verhoeven’s early work; she also gained much attention for her portrayal of Hannie Schaft in The Girl with the Red Hair. Her presence in Suspiria appears to be the result of some homage casting by director Luca Guadagnino, who has also included Fassbinder favourite Ingrid Caven and “slow cinema” doyen Fred Kelemen among his eclectic ensemble. At the other end of the spectrum, the film features the likes of Fifty Shades starlet Dakota Johnson and Marvel actor Tilda Swinton (admittedly, the latter is no stranger to arthouse fare, and both actresses have worked with Guadagnino before). Argento, who has a producer credit on the new film, also went with some surprising actor choices for his original, casting old pros Alida Valli and – in her final film role – Joan Bennett. Guadagnino’s film is set in 1977 – the year Argento’s film was released – and the basic premise is the same as the earlier movie: young American Susie (Johnson) arrives in a wet and windy Germany to study at a prestigious dance school. Susie’s arrival coincides with the disappearance of fellow student Patricia (Chloë Grace Moretz), who’s convinced that the academy is run by a coven of witches. It’s no real secret that Patricia is actually telling the truth, and she tries to impart this information to her psychotherapist, who in turn tries to tell the police that the girl’s disappearance is the work of the women in charge of the school. The West Berlin police have little time for such tales, given that both the city and the country are in the grip of a fear perpetrated by the Red Army Faction; as Suspiria unfolds against the backdrop of the German Autumn, you could say that two types of terror are simultaneously at work here. Such a move grounds proceedings in a reality that was wholly absent in Argento’s film – a work which could easily be viewed as a colour-saturated fever dream. As fascinating as the Baader-Meinhof story is, I’m not convinced that Guadagnino’s idea is the better of the two. While either one of these two plot threads would be enough for one movie (cf. 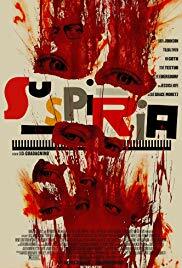 Argento’s Suspiria and The Baader Meinhof Complex), Guadagnino and his scriptwriter David Kajganich add on another layer involving German national guilt and the holocaust; at times, this aspect provides some poignant moments, yet at other points it feels borderline distasteful. Linked to this element, however, is a sad and touching story involving Patricia’s psychotherapist, the inconsolable Dr. Klemperer (Lutz Ebersdorf), whose wife (Jessica Harper, star of the original film) vanished in the chaos of 1943. Klemperer regularly crosses divided Berlin to visit the couple’s East German dacha, where he feels the sadness especially keenly. The doctor’s tragic story is obviously a motivating factor in his determination to solve the disappearance of Patricia, but his enquiries inevitably lead him to the sinister dance academy and its icy lead choreographer Madame Blanc (Swinton), who presides over a number of matrons (played by Soutendijk, Craven and Sylvie Testud, among others). Klemperer tries to warn another student, Sara (Mia Goth), of the sinister nature of the academy, but she angrily dismisses his claims; Sara has befriended Susie, who we should remember is both the film’s main character and the star of ominous dance show Volk, which the students are preparing for a public performance. Suspiria is something of a paradox: there was absolutely no need to remake Argento’s masterpiece (which is now available on an outstanding 4K UHD disc), yet the very idea of doing such a thing provided a level of intrigue which made it, at least for me, one of the most anticipated films of 2018. An inherent weakness of the new film is that Guadagnino is no director of horror, let alone an Argento, and it’s obvious that he’s looked to other areas to compensate for this; the film is never scary, and it falters whenever it has to deal with familiar genre tropes – although it is occasionally unsettling. It is, incredibly, nearly a full hour longer than the original, and wears its pretension on its sleeve as it languidly moves through its “six acts and an epilogue”. And, while immaculately photographed, it doesn’t come close to replicating the unique visual aesthetic of Argento’s film. There are lots of other reasons why the film shouldn’t work, but, just like the witches featured here, it sure knows how to cast a spell. The closest point of comparison for the movie is Gus Van Sant’s Psycho – both films share a perverse aim in remaking an established masterpiece, and the two remakes stand as bizarre art exercises whose existence is infinitely stranger than any of their content. Which is saying something in the case of Suspiria, which is an elliptical, fragmented rumination on motherhood and collective memory masquerading as a horror film. However, the movie does very much succeed in creating a strong sense of time and place: Bowie’s Berlin is that most atmospheric of settings, and the film is certainly an immersive experience which pulls you down the rabbit hole right from the off. The performances are committed, too, with Johnson making for a surprisingly appealing lead, while Goth continues to impress. But the film very much belongs to Swinton, whose work here is nothing less than staggering – it’s best if you can go into the movie without doing too much reading up on it, as you’ll find the experience to be all the more rewarding if you’re ignorant of certain facts; at the very least, make a point of avoiding the film’s IMDb page until after the screening. Guadagnino’s take on Suspiria, then, is a quite unique beast: pointless, yet also a must-see. Another guest blog written by Darren Arnold.